JS Kabylie has not submitted any formation. Africa Sports has not submitted any formation. Cross by Islam Bendebka... into the clouds! Jean-Philippe Dindane gets the yellow card after a foul. Jean-Philippe Dindane in a tackling... and looses it! Islam Bendebka has the ball and sees his opponent in front of him... but he can win the tackling. Cross by Jean Koffi... into the clouds! 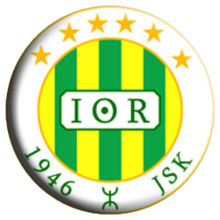 Tooor fur JS Kabylie! Lakhdar Mekhloufi legt auf Ramy Medjani ab, der nur noch einschieben muss. Header by Aïssa Slimani... that was close. Jean-Philippe Dindane passes the ball... and the ball is out. Jean Koffi tries to pass the ball to the strikers... but misses! Aïssa Slimani shoots... but the goalkeeper can turn the ball around the goalpost. Armand Koffi passes the ball towards the centre... but the opponent catches it. Mamadou Saha runs towards his opponent and wins the tackling! Lakhdar Mekhloufi passes the ball towards the centre... but the opponent catches it. Header by Aïssa Slimani... but missed. Armand Koffi passes the ball... and the ball is out. Armand Koffi steals his opponent's ball in a tackling. Jean Koffi has the ball and sees his opponent in front of him... but he can win the tackling. Karim Bendebka tries it with a strong shoot... but missed. Mamadou Tébily tries to pass the ball to the strikers... but misses! Armand Koffi has the ball and sees his opponent in front of him... but he can win the tackling. Islam Bendebka passes the ball towards the centre... but the opponent catches it. Idriss Bounedjah tries it with a strong shoot... but missed. Header by Rachid Khadda... but missed. Benjamin Boga shootstowards the goal... and the ball is in! Cross by Rachid Khadda... into the clouds! Rachid Khadda has the ball and sees his opponent in front of him... but he can win the tackling. Benjamin Boga shoots... but the goalkeeper can turn the ball around the goalpost. Ramy Djabou in a tackling... and looses it! Benjamin Boga shoots... into the sky. Daniel Diarrassouba tries it with a strong shoot... but missed. Adlène Tasfaout passes the ball... and the ball is out. GOAL - what a trick by Daniel Diarrassouba! Cross by Salah Saadi... into the clouds! Salah Saadi runs towards his opponent and wins the tackling! Daniel Diarrassouba shoots towards the goal... but into the arms of the goalkeeper! Salah Saadi tries to pass the ball to the strikers... but misses! Benjamin Boga tries to pass the ball to the strikers... but misses! Adlène Tasfaout hits his opponent and gets the yellow card for that. Adlène Tasfaout lets taken away the ball. Adlène Tasfaout has the ball and sees his opponent in front of him... and looses the tackling. Benjamin Boga has the ball and sees his opponent in front of him... but he can win the tackling. Cross by Adlène Tasfaout... into the clouds! Mamadou Saha tritt den direkten Freistoß und trifft! Islam Bendebka gets the yellow card after a foul. Jean Koffi runs towards his opponent and wins the tackling! Aïssa Slimani runs towards his opponent and wins the tackling! Jean-Philippe Lombe runs towards Lakhdar Mekhloufi... and looses the ball. Idriss Bounedjah tries to pass the ball to the strikers... but misses! Mamadou Tébily lets taken away the ball. Karim Bendebka passes the ball... and the ball is out. Lama Doumbia tries to pass the ball to the strikers... but misses! Aïssa Slimani in a tackling... and looses it! Jean-Philippe Dindane passes the ball towards the centre... but the opponent catches it. Freistoß für JS Kabylie! Lakhdar Mekhloufi schießt, aber zu ungenau. Lama Doumbia gets the yellow card after a foul. Lama Doumbia in a tackling... and looses it! Lama Doumbia passes the ball... and the ball is out. Mamadou Tébily shoots... but the goalkeeper can turn the ball around the goalpost. Karim Bendebka tries to pass the ball to the strikers... but misses! Mamadou Saha lets taken away the ball. Idriss Bounedjah shoots... but the goalkeeper can somehow catch it. Lama Doumbia passes the ball towards the centre... but the opponent catches it. Lama Doumbia has the ball and sees his opponent in front of him... but he can win the tackling. Jean-Philippe Lombe lets taken away the ball. Jean-Philippe Lombe shoots towards the goal... but into the arms of the goalkeeper! Karim Bendebka runs towards his opponent and wins the tackling! Islam Bendebka shoots... but the goalkeeper can somehow catch it. You need to be signed in and at a match report in order to send messages.